I recently had the privilege of interviewing Hannah Perry, founder of the Giggling Pig Art and Party Studio in Shelton, Connecticut. The studio is a fixture in her community, letting children of all ages take part in art classes or after-school enrichment programs. It’s a place where creativity and curiosity flourish. But what's truly great about is that Hannah embodies the quintessential American success story, from her arrival in the U.S. with little more than pocket change, to the present day, which finds her mulling franchising options and planning for the long haul. Here's her story. Hannah founded the Giggling Pig Studio in 2005, but didn’t open her first location until 2011. The studio takes its name from a children’s storybook that Hannah wrote and illustrated called The Giggling Pig and Friends. This love of whimsy and playfulness inspires everything Hannah has accomplished in recent years. Let’s take a step backward. How did this all start? Hannah grew up in England and began her professional life caring for the children of royalty in Italy and Switzerland. It was with this experience that she moved to the U.S. and got her first job in 1999. Life was tough for a while. Hannah arrived in the States with essentially nothing. You heard that correctly. Hannah built her business with just barely enough money to afford two slices of pizza and a Snapple. She worked a full seven days each week for a while, and slowly grew her studio’s footprint from a single room into the impressive business it is today. The Giggling Pig now occupies a two-thousand-square-foot facility, with both indoor and outdoor areas. The recipe for success has as much to do with having a clear vision as it does with recognizing passion and talent. Hannah has surrounded herself with people who share her love of children, and her business proves the value of that dedication every day. It’s not every day we hear about a business that started from nothing becoming a pillar of the community. When I pressed Hannah for advice on how other businesses could follow her example, she said: “I think my attitude has a lot to do with it.” If she’s stressed out, she says, her employees will pick up on that. In an environment that’s supposed to be positive and uplifting for children, staying upbeat is more important than ever. She continues: “I think something I’m learning …. Is to be extremely organized all the time. To make a list of things that need to be accomplished.” Staying organized sometimes feels like an arcane art, but modern technology offers all sorts of ways to get it done. For example, internet connectivity is now ubiquitous, letting us stay in touch with our clients no matter where we are, even letting you view voicemails as plain text in your inbox, which has made the singular frustration of dealing with phone messages a thing of the past. The task of dealing with challenges in the present while always looking toward the horizon is a tricky balancing act. But, again, it’s all about the children. For Hannah, the point of pushing towards new things is all to create a memorable experience for her young clients. She says it’s easy for a business like this one to grow stale fast if you don’t keep changing and innovating. Children crave novelty, and so far, Hannah seems up to the task. 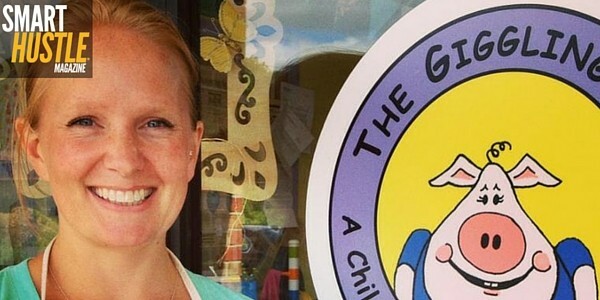 Founder of @TheGigglingPig, Hannah Perry, shares how she turned $15 into #business success! Finally, our conversation turned toward some of the practical matters that every business needs to be mindful of, even when it might not be fun. How do you get the word out about a growing business like this one? As usual, Hannah surprised me. The Giggling Pig doesn’t take out newspaper ads or billboards. They do have a strong web presence, but most of their foot traffic is driven by word-of-mouth testimonials. Their Facebook page and website are constantly being updated with new photographs and events. If there’s a message here, it’s to never underestimate the importance of your web presence. The Giggling Pig website is cheery and bright, and it offers a comprehensive look at what the Studio has to offer for new and existing clients. Because of their mindfulness of these tenets of modern advertising, Hannah says Giggling Pig is currently looking at franchising options, and in five years’ time, she hopes to see Giggling Pig Studios “everywhere” in America. At the end of our interview, it was clear to me that Hannah’s story was remarkable — partially because it proves that a healthy work-life balance is possible. She has remained a doting mother, even as she’s grown her business by leaps and bounds. This feel-good business success story should offer encouragement to aspiring entrepreneurs everywhere.